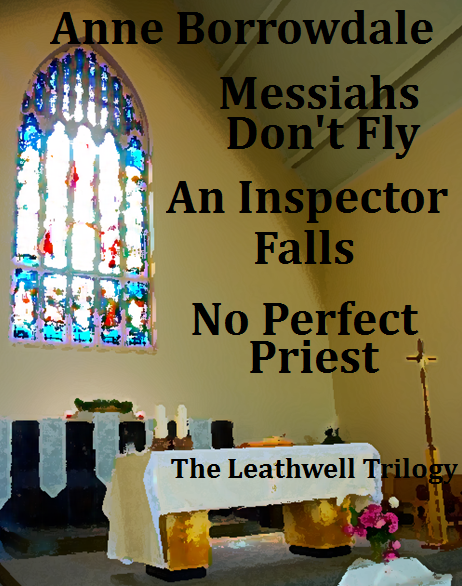 The final novel in the Leathwell trilogy. A woman priest trying to put an affair behind her. A bishop with a past, and a paranoid fear of the press. A compelling and thought-provoking exploration of attitudes to sexual morality in the Church of England. 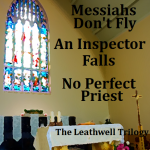 Get all 3 books in the Leathwell trilogy – Messiahs Don’t Fly, An Inspector Falls and No Perfect Priest – from the Kobo store in this new e-edition. Only £3.99. I’ve just finished No Perfect Priest – really good. I needed a lot of tissues during the ending! It raises all sorts of emotions – anger re the bishop obviously but what really got to me was the way you drew the wonderful generousity of ‘ordinary’ parishioners – that’s so often true. It struck me on reflection that this novel underlines that the hope of the Church is the humanisation of the church. No Perfect Priest is very good indeed – witty, moving, challenging, tremendously well-informed, full of insights and stylishly written. I’m really enjoying it. It’s had me close to tears, and I haven’t got to the end yet! ‘At least it’s not a migraine this time,’ the bishop said, reaching out to take the cup. His last word was lost in the noise of the crash as the woman at the sink let go prematurely. The cup hit the stone floor and shattered at his feet. Water shot outwards as it fell, leaving damp blotches spreading across the grey of his trousers. The other washer-up laughed. ‘Whoops, Bishop, what a butterfingers! You …’ She saw his expression, and stopped. ‘Oh, really! Look at this mess! Could you not have been more careful? I’m soaked! I’ll be sitting in the car for hours in wet trousers. It’s too bad …’ Christopher Ridgefield tutted to himself as he brushed an ineffectual hand at the patches. Alison Thompson, watching from the doorway of the school kitchen, saw the first woman redden at his words, vivid blue eyes aghast under finely arched brows, the sagging skin of her cheeks beacons of colour beneath the swept-back, golden highlights of her hair. ‘I’m sorry, I’m so sorry,’ she said. She squatted awkwardly on the floor to gather up the broken crockery while her fellow helper fetched a mop. Oh for God’s sake, Bishop, grow up, Alison would have said, had she not retained a vague memory from her ordination of promising due respect to those in authority.